Although most editing will be based on moving the automatically-created grouped blocks of measurements, these blocks can also be combined or split using commands in the menu shown below which appears when RIGHT CLICKing in the output track Pitch display. If the Playhead is placed at the point of required split, then RIGHT CLICKing the track and selecting Split Group at Playhead from the pop-up menu will divide the pitch block at the Playhead into two blocks. Select one pitch value with the mouse cursor, holding SHIFT key down, moving the cursor going to last measurement to put in new group, RIGHT CLICK and select Group Selected Values. Create a Playback range (yellow bar at the top) that is the length of the signal section where you want to group the pitch measurements together. 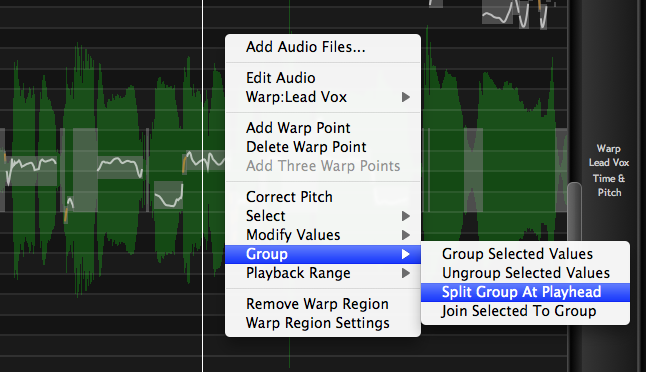 Then RIGHT CLICK in the output track and select Playback Range and then Make Group from Play Range. An interesting feature of Revoice Pro is that Groups or values of pitch can be copied [using CMD C (Mac) / Ctrl C (Windows)] for example from one Pitch Block to another Pitch Block [using CMD V (Mac) / Ctrl V (Windows)]. The copied values will be distributed linearly in the destination group if there is a difference in duration of the source and destination.